“Equiyo” is a method. It combines the practice of Yoga with the discipline of riding. It’s a method of creating a better relationship with your body, a deeper connection with your horse and real inner growth. In riding we talk about a discipline (such as Dressage), to describe a methodology of riding. However, a discipline also insinuates a path that takes dedication and commitment to master. Yoga is no different. Yoga comes from a Sanskrit word meaning “Union.” The practice Equiyo is an expression of the union between horse and rider – not strictly by the technique and improved performance of our riding but also in the relationship we have with our horse. 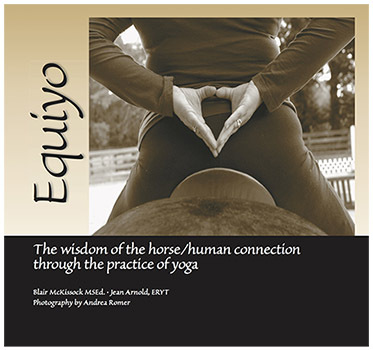 It is our deepest wish that by employing the practices described in this book, you not only improve in your riding technique – regardless of the discipline – but more importantly that you foster an even deeper connection with your horse. This solidified connection can help to improve the quality of your life. In the following text we will describe the basic foundations of the philosophy behind the method of Equiyo and additionally, examples of the everyday practice. This book is not a “how-to” guide but rather an introduction to Equiyo to help you get started. The photos in this book are a representations and examples of the poses used in practice.